It is around 100 days until Lara and I run a 5 kilometre Race for Life to raise vital funds to support Cancer Research UK. Our fundraising is off to a good start, with 30% of our £500 target raised already. Our fundraising will really kick off in the next few weeks and there are lots of fundraising ideas and support packs available through Cancer Research UK online to help us. Lara had been running with me almost every weekend, just for 1-2km each time, and often very stop-start. With our Race for Life approaching, I am keen to try and teach her to run the distance. About 10 months ago I went through the same thing myself. I used the NHS Couch to 5k scheme to help me go from nothing, to running for a full 30 minutes without stopping. It took me 7 weeks, running three times a week to be able to run 5km without a break and at the time it took me nearly 39 minutes to complete the distance. Race for Life do have a series of 5k training plans available for whether you are planning on walking, jogging or running your Race for Life. I have decided to teach Lara using my own interpretation of the couch-to-5k scheme because we really only get a chance to run together at the weekends and because she is 5, she can't reasonably go for a run without me during the week!!! Next weekend I am completing my Run England "Leadership in Running Fitness" course so training Lara up is good practice for my new coaching skills. This past weekend I hoped to teach Lara to run in short repeats. To push your body even when your brain is telling you to stop. This is a phenomenally hard skill to learn, whatever your age but it is very hard to explain and to justify to a 5 year old. We jogged for 3 minutes, and then walked for 90 seconds. We did this over and over again for around 4.2 kilometres. We held hands, we talked and giggled. 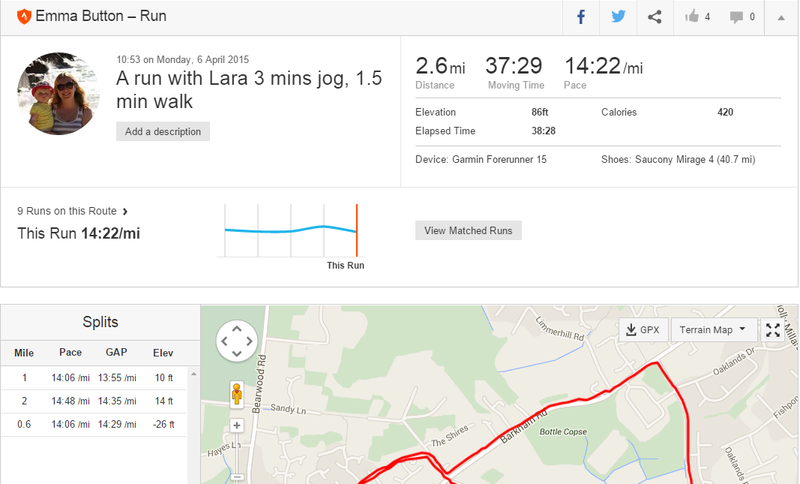 I showed Lara some of my favourite countryside running routes (it always surprises me how quickly we can be in the middle of the country given that we live in a fairly built up town). Yes she did pester me every time those 3 minute stretches were beginning to drag but when we reached the end of each interval we had a nice rest and a chat. I loved it. She loved it. I can't wait to do it again. This weekend I intend to vary the intervals a bit. Maybe 8 minutes jogging, 3 minutes walking? That's a harder test of your body and brain's ability to keep on running. I'm sure Lara will take it all in her stride. I think she has a lot of energy and can probably run a lot faster than me once she has mastered the art of will-power and has learned to pace herself. I don't think it will be too long before she can jog the full 5km race distance with me - a massive achievement for a 5 year old. I have set up a JustGiving charity donation website for myself and Lara which took a matter of minutes to do. We would LOVE it if you could sponsor us to complete our 5k challenge, whatever you can afford. Maybe you fancy joining the Pink Army this summer? If you fancy joining in with the Race For Life challenge yourself then I have a £2 discount code off the cost of entry to any 2015 Race for Life. Just quote RFLMel when entering the race online. if you do join up, please leave me a comment below to let me know when and where you will be running - it'd be great to give each other support.